But first he had to rescue himself. Coast Guard pilot Jason Brownlee, at right, is seen with commander John Egan, left, and flight mechanic Eric Cybulski, center. ELLINGTON FIELD JOINT RESERVE BASE, Texas ― At 3 a.m. on Sunday, Jason Brownlee, a pilot with the U.S. Coast Guard, woke with a start. His phone was ringing. While he was asleep, Hurricane Harvey had slammed into the greater Houston area, bringing extreme winds and heavy rainfall. 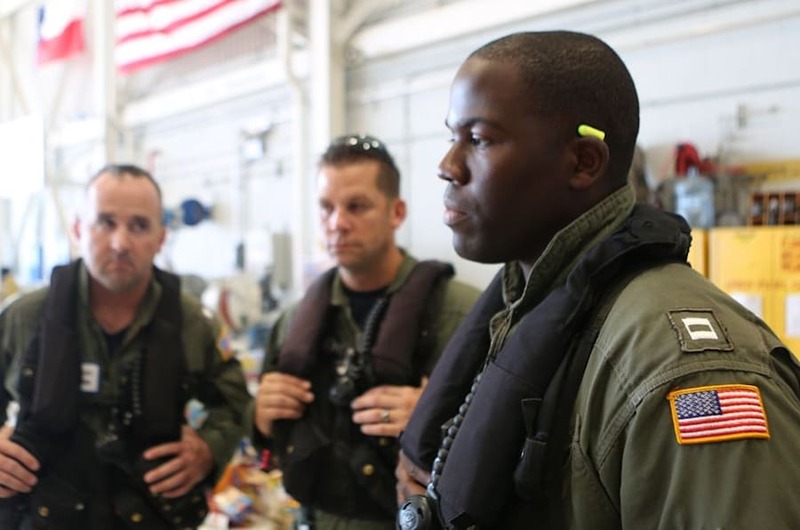 His bosses wanted him back at the U.S. Coast Guard Air Station Houston ― ASAP. There was one problem, though. Brownlee, 34, was already flooded in. "Every road that I could take to get in was impassible," he said. So his team pulled the maneuver they knew best: They scrambled a rescue aircraft and picked him up in an elementary school parking lot near his house. "I came in, put my uniform on, grabbed my gear, a crew, a helicopter," and took off, he said, flying the first of what would be many rescue missions in the days to come. Flying over Port Arthur and Beaumont revealed widespread flooding and devastation from Hurricane Harvey. The full extent of Harvey's devastation is still unknown. More than 32,000 residents have sought refuge in shelters after being displaced from their homes, and at least 38 people have died. But many more were saved ― including by pilots like Brownlee. So far, more than 72,000 people have been rescued. According to a U.S. Coast Guard spokesperson, at least 744 aerial rescues in the greater Houston area have taken place since the storm began. On Friday, one week after Harvey made landfall in Texas as a Category 4 hurricane, Brownlee's unit took HuffPost reporters on a reconnaissance mission to survey flooding around Port Arthur and Beaumont, two cities among those hit hardest. Much of the area surrounding these towns is still underwater, and rescue efforts are ongoing. A lot of industry and infrastructure sustained damage during Hurricane Harvey, including railroads, roadways and various industrial plants. The sky was sunny and clear as the MH-65 Dolphin helicopter took off ― a far cry from the flying conditions that Brownlee battled during the storm. On Monday, he flew a search and rescue mission through a torrential downpour, the worst weather he'd ever witnessed as a pilot. He couldn't see anything except the ground directly below the nose of the aircraft. "We were using Google Maps to fly above highways, because we know that there are no towers over the highways," he said. "I don't think I'm ever going to forget that experience." Seen from the sky, the destruction caused by Harvey was on full display. Mile after mile brought scenes of dramatic flooding, with entire fields and neighborhoods swallowed up by water. Cattle stand on a small piece of land surrounded by floodwaters. Cows congregated on tiny sections of dry land, surrounded by water. Interstate 10, a major connecting highway, was a river. Tractor-trailer trucks stood abandoned along the road. Eric Cybulski, a flight mechanic who has been with the Coast Guard for 19 years, kept his eyes trained on the ground, looking for anyone in need of rescue. The destruction, he said, reminded him of the 11 days he spent responding to Hurricane Katrina in New Orleans, in 2005. "We would get the smells from downtown ― the winds would shift and the smell of death would come," he said. "Being here, it brings back the emotions, for sure." The only thing they had to drink during the Katrina mission was blue Gatorade, he said. To this day, he can't stand the stuff. In Beaumont, a line of cars snaked around the block, waiting for supplies at a distribution center. Outside a housing complex, a high-water vehicle pushed through deep water. Another Coast Guard helicopter flew past, transporting a victim who'd just been rescued. 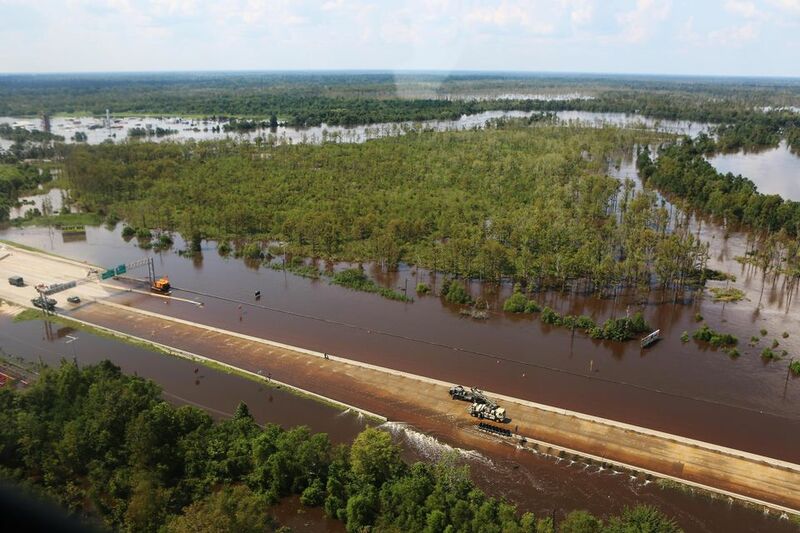 Highway I-10, a major connecting interstate, is underwater near Beaumont, Texas. Coast Guard rescue workers had been working nonstop since the hurricane made landfall. Many of them left families behind. One serviceman's wife was in labor as he worked to aid his community. 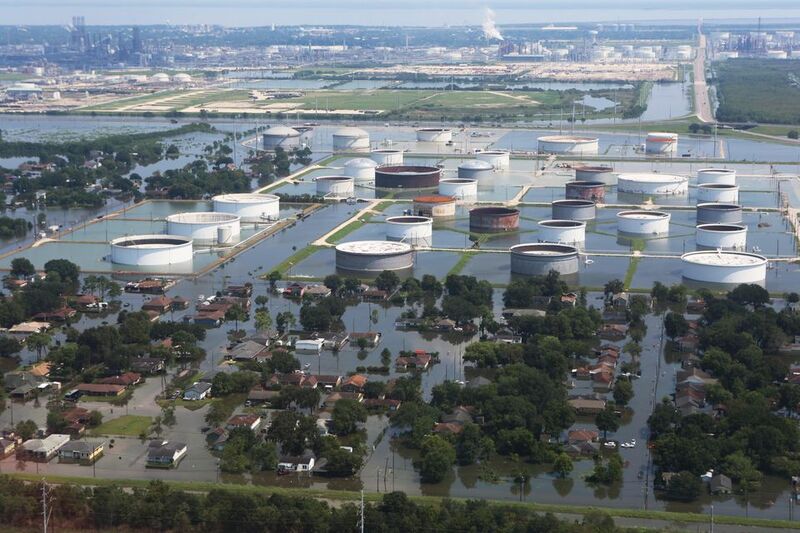 Several Guardsmen at Ellington Field lost homes and vehicles of their own, while others, such as Cybulski, were initially unable to get to the air base to help because of severe flooding. "This one caught a lot of people off guard," Cybulski said. 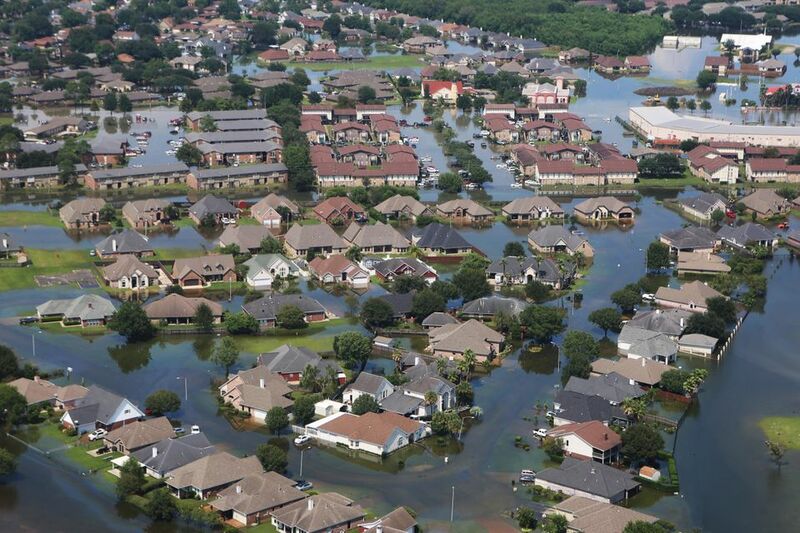 "I don't think the Houston area was expecting something of this magnitude ― this much rain." Brownlee said he was humbled after flying over Houston early on in the storm. He didn't see any damage, and although he was ready to act at a moment's notice, he figured the worst was over. Hours later, he'd wake up to a call demanding that he get back to his chopper. "My famous last words were, 'Hurricane Harvey is going to be nothing,'" he said. He would save 20 lives over the course of the next few days ― three times as many people as he'd rescued since he became a pilot three years ago.